The BMW X6 midsize SUV comes with seating four four. It has two models: the xDrive35i and the xDrive50i, and comes standard with turbocharged inline six engine, an automatic eight speed transmission, and an all wheel drive system. The X6 gets between fourteen and sixteen miles to the gallon based on the trim level. 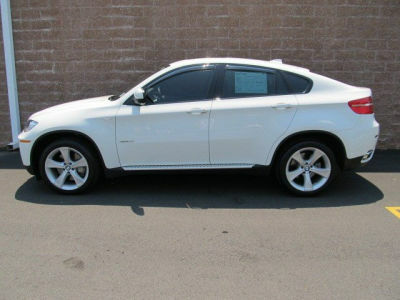 For the best selection of BMW X6 For Sale in Lynnwood, come in and visit us at Carson Cars. The xDrive35i model offers park assistance sensory in the rear and the front, a sunroof, xenon head lamps, twin region climate control, speed control, power retractable exterior mirrors, a power operated lift gate, leather upholstered and lumbar supported power seating, integration for iPod, Bluetooth and USB devices, HD radio, an audio system with ten speakers, a CD player, along with iDrive and BMW Assist technology. The xDrive50i adds a stronger engine and navigation technology with voice command. Optional features are available through several packages which offer quad region climate control, remote entry and start, a top and rear visibility camera system, cooled seating with massage capabilities, self cleaning head lamps, heated seating in the rear, a heated steering wheel, a head up display, a side visibility camera, an adaptive suspension system, steering with speed sensitivity, satellite radio, upgraded color choices, a sixteen speaker audio system, larger wheels performance tires, lane departure notification, an entertainment in the rear, and BMW Apps interface. The standard safety equipment on the BMW X6 includes curtain and side airbags, airbag deactivation, safety belt pretensioning, brake drying, brake assist, four wheel ABS, and BMW Assist. This technology provides notification of deployed airbags, remote door unlocking, system diagnostics, towing service, detailed directions, and theft recovery. Visit us online or in person at Carson Cars to view our impressive inventory of BMW X6 For Sale in Lynnwood.